CEDAR CITY — On the heels of being named one of the Top 20 rural hospitals in the nation, the Cedar City Hospital’s Intermountain Foundation recently received a $5,000 gift from the Rocky Mountain Power Foundation. The donation will contribute to the hospital’s purchase of wireless mobile fetal monitoring systems for mothers in labor. When these moms that are in labor come in, they have these big baby monitors. … They usually roll around on casters and have a big machine that looks like a bunch of VCRs and a bunch of cables coming in and out of them. They hook those cables up to the mom, and they monitor both mom’s vitals … and the baby’s heart rate, and it compiles that information and warns the nurses if something is awry. The problem with those monitors is that they are big and on casters and have to be plugged in. When you’re hooked up, you’re in bed. There is really nowhere else to go. The new monitors — part of the new GE Mini Telemetry System — make all of that wireless. Natural childbirth is becoming a much bigger trend, France said, and the ability of those mothers to get up and walk around in the hallways helps with the pain. He added that, while typically the actual deliveries ultimately take place in a bed, the wireless monitors also allow mothers to have water births in a tub. The wireless monitors are $5,000 each, so the donation from the Rocky Mountain Power Foundation will allow them to purchase one unit. The hospital is very grateful for the support, France said. The Rocky Mountain Power Foundation is the philanthropic arm of the power company. 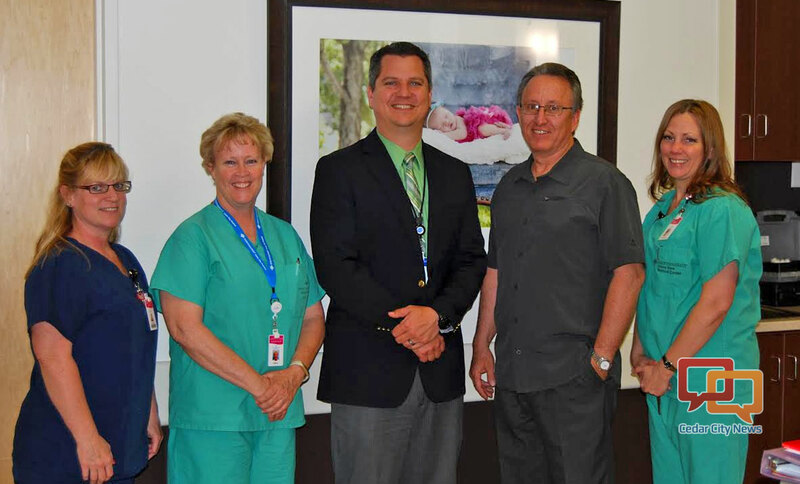 Regional Business Manager Tom Heaton said in a news release that Rocky Mountain is proud to support the hospital with the gift that will help bring the Cedar City Hospital the very latest in technology and safety. The Intermountain Foundation of Cedar City Hospital supports capital projects and expands the services provided to those who live in the Iron County area. Philanthropic support from a generous community, Rocky Mountain’s news release said, has helped fund the construction of the Sandra L. Maxwell Cancer Center, Ellsworth Jubilee Home and Cedar City Hospital’s Cardiac Rehab Facility. France said this type of support makes the difference between being a great hospital and being a Top 20 rural hospital in the country. “The reason we are as good as we are is because people are doing these things all the time to make us better,” France said. The recognition as one of the Top 20 rural hospitals came from the national health analytics group iVantage at the end of April. The award is given to hospitals that score in the top 20 in the nation in areas such as patient perspective, cost, quality and outcomes — the end result of getting care. The staff works extremely hard to not only do their jobs with the best skill and care, but also deeply care about our patients and go the extra mile to ensure they feel safe and at ease. Our hospital has been recognized again and again on a national level for being exceptional, and I am very proud of our staff that makes us one of the best rural hospital in the nation. Terri Kane, vice president of the Southwest Region of Intermountain Healthcare, said rural health care faces unique challenges. The National Rural Health Association plans to honor the winning hospitals at an awards ceremony as part of its Rural Hospital Innovation Summit scheduled for May 12 in Minneapolis. Other Utah hospitals included in iVantage’s Top 100 Rural and Community Hospital 2016 listing included Bear River Valley Hospital and Sevier Valley Medical Center, both Intermountain Healthcare facilities. Utah hospitals included in iVantage’s Top 100 Critical Access Hospital listing included Delta Community Medical Center – an Intermountain facility, and Gunnison Valley and Moab Regional hospitals.